The River Faughan rises in the Northern Sperrins and makes its way west, through rural countryside as it passes by Claudy and Ballyartan. At Drumahoe it swings in a North Westerly direction as it moves through a more urban setting for a couple of miles. Then it returns to a rural landscape as it makes its way down past Campsie and on into Lough Foyle about 3 miles North of Derry City. Bessies Dam near Drumahoe.The Faughan is a spate river, where the first fish arrive towards the end of June, and move quickly through the river once they have negotiated Campsie Dam. The quality of the fishing depends on the spates, and then the best of the fishing is at, Campsie, Ardlough, Drumahoe, Ardmore, Brackfield and Claudy. Around the Claudy area, you can fish from Dungorkin Bridge (near the Foreglen) down towards the new treatment plant. Wading the pool at the treatment plant can be a little tricky. Claudy country park (around Ballynameen bridge) has some nice water for spinning, which is best approached from the right bank going downstream. There are two good pools just upstream of Mc Candless bridge before you reach the confluence of the Glenrandal River. Downstream of Mc Candless bridge is particularly good for fly fishing in the streams and glides, from the first corner, right down to Crossan’s Flatts from the right bank. Crossan’s flatts is a good and is best approached from the left bank (down towards the wier). Crossan’s Flatts are best for spinning and bait, as is the the dam itself. Both the Flatts and the dam are good for night fishing for trout form the end of june. The Dog Hole near Brackfield (Ness Nurseries)The river can be fished fairly comfortably with a 10 foot rod, right up the Killycor Bridge (between Claudy and Park). 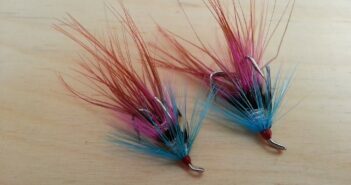 The river actually gives it’s named to two well known flies, the Faughan Purple and Faughan Shrimp. 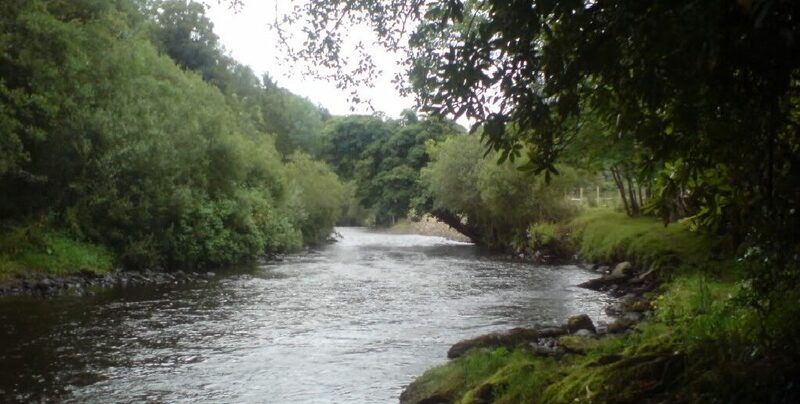 The Faughan at ClaudyThe Faughan is probably the most prolific Sea Trout River in the Foyle system. They first appear in the tidal waters in June and make their way quickly upstream towards Drumahoe. 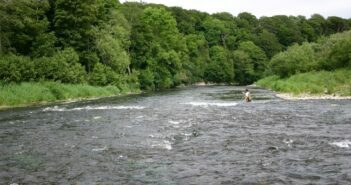 The Sea Trout fishing is excellent in this stretch, with the average fish weighing around a pound and a half. 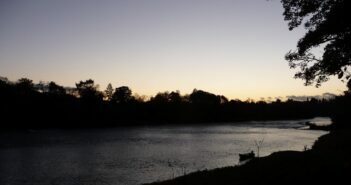 The fishing peaks around the end of July and, as with most Sea Trout angling, the best time is just before dawn and just after sunset. A nice brace of fish from the Faughan. No River Faughan tributaries listed.